If you have experience problems with Whirlpool 1188694, so you can read the manual or user guide. The manual provide important information especially about troubleshooting. Is the air purifier turned on? Was a regular fuse used? Use a time-delay fuse or time-delay circuit breaker. The Whirlpool 1188694 user manual is consist of 12 pages with file size of 441 KB. It's available in english and spanish language. Turn the fan speed knob to Off. Unplug air purifier or disconnect power. Place fingers on the front release tabs. Gently push the tabs in and pull the front grille forward to remove it. Remove both filters and set aside. Do not try to wash and reuse either the HEPA filter or the pre-filter. Gently wash the front grille in soapy water. NOTE: The grille is not dishwasher safe. Reassemble the filters as shown in the previous illustration. 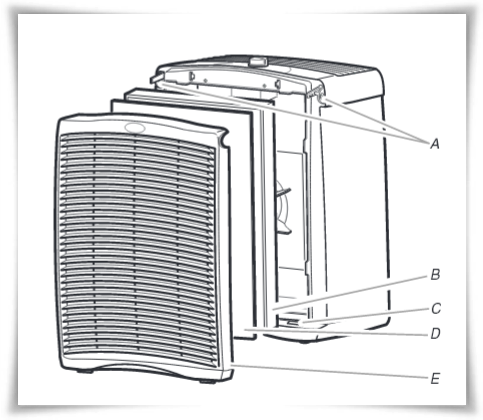 Place the bottom tabs on the front grille into the slots in the base of the air purifier. Push the top of the grille forward until the grille locks into place. Plug in air purifier or reconnect power.